Get your morning coffee and while sipping it, close your eyes, and imagine what being an AWESOME DBA, means to you. I don’t know what your imagining, but I want to tell you that many times we do have preconceived ideas and limiting beliefs about what being an AWESOME DBA means to us. If I only get the OCP, OCM certification…you name it, then I will be an AWESOME DBA…. You don’t need a certification to be an AWESOME DBA! You don’t need to present at Oracle Users Groups and conferences to be an AWESOME DBA! 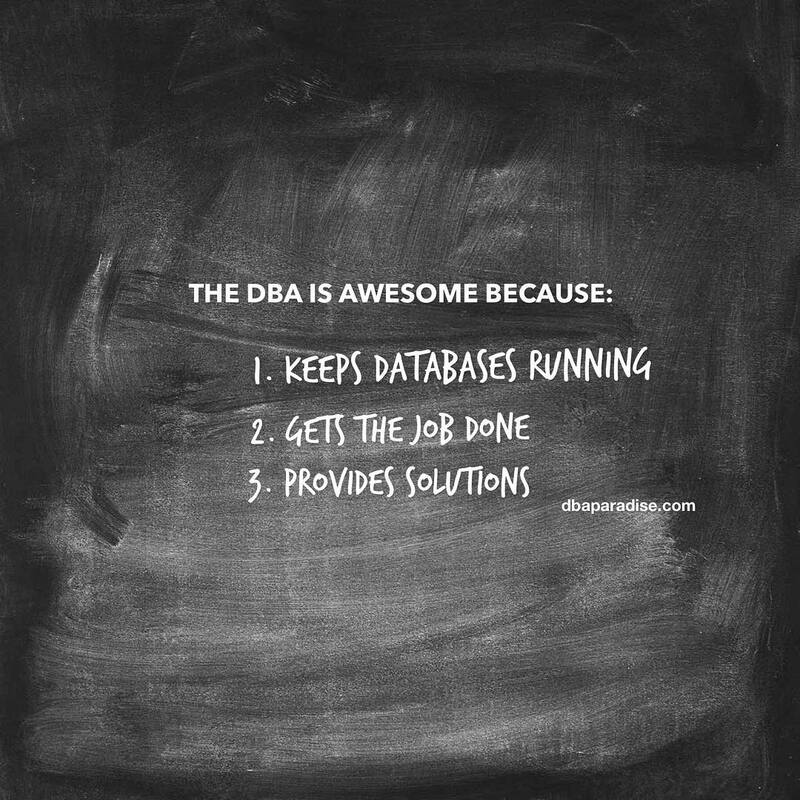 You don’t need to have a blog and write articles, white papers or books, to be an AWESOME DBA! You don’t need to have 10-20-30 years of experience, to be an AWESOME DBA! You don’t need any of this, to be an AWESOME DBA. This is just the icing on the cake! Being awesome at something is a mater of perspective. Think about it for a minute. Do databases run better if you are OCP certified? Do your deployments run better because you wrote an article on a blog? Do you do a better job because you presented at a conference? My intention with this blog post is to open your eyes to the Amazing DBA that is within you! Really, why are we DBAs so freaking AWESOME? The DBA makes sure databases are available for end users. You think this is not much? If something breaks and creates an outage, the DBA not only fixes it, it also comes up with proactive approaches/methods to prevent the incident from reoccurring. We are constantly asked to deliver. A user needs access immediately to the production database. A project manager needs an audit report and explanation for the audit entries by 9:00am. There are change controls scheduled to be deployed today and you need to prepare. This is a pretty typical day in the life of a DBA. I get it. From the user’s perspective the access to the database is the most important thing, that’s why they need it immediately. With all the pulls in different directions, we get the job done, and make things happen. At the end of the day, we deliver that report, we deploy the change to production, we get the access for the user setup, and even deal with the emergency production issue! The DBA either knows the answer or it finds it for you. DBAs do not give up in front of challenges. DBAs keep troubleshooting or thinking about the problems, until they find solutions, and answers. Now, give yourself a big pat on the back and acknowledge yourself for doing an AWESOME JOB every single day! I would love to hear from you. Why do you think DBAs are AWESOME? Leave a comment below, or email me at diana@dbaparadise.com! If you enjoyed this article, and would like to get REAL SOLUTIONS for REAL, EVERYDAY PROBLEMS, sign up below, and you will receive The Ultimate 3 Step Guide To Find The Root Cause Of The Slow Running SQL!